NEWPORT BEACH, CALIF. (November 19, 2018) – The Intercollegiate Sailing Association (ICSA) Match Race National Championship for the Cornelius Shields, Sr. Trophy was completed yesterday after three days of racing. Boston College came away the winner for the second year in a row. The event began on Friday, November 16, hosted by Stanford University at the Balboa Yacht Club and racing took place on the south side of the Newport Beach pier in Governor’s Cup 22 class keelboats. PRO Ryan Davidson led racing. Ten college sailing teams qualified to compete in the championship having advanced from their own conference qualifiers. Each team had four crew members one of which was required to be female. The match-racing format is one boat pitted against another boat and a team of umpires supervises each race. The regatta isa set of five stages and racing took place on a Windward/Leeward course with mark rounding’s to starboard. Races in the first stages of the regatta are meant to take 15 to 17 minutes to complete and in the Semi-Final and Final rounds 18 to 20 minutes to complete. In stage one all ten teams competed in a single round robin. This stage began around 11:30 am in a light southerly wind and lasted the entirety of the day. By 4 p.m. seven of the nine flights had been completed. SUNY Maritime College led after the first day of racing with a record of 6-0. They showed strong boat handling in the Governor Cup 22s. Stanford University followed closely in second with a 5-1 record and there was a tie for third place between Boston College and Dartmouth College both with a record of 4-2. The second day consisted of completing the first round of racing and the Repechage Round between teams in 7th-10th place was scheduled. Day two of racing saw light winds and large swell waves. The first round was completed around 1 p.m. and due to time constraints with the conditions the Repechage round was eliminated. Racing continued with the Quarterfinals round, which was adjusted to a first to 2 points format. The 9th and 10th place teams sailed off for final positioning and the University of Washington beat the Texas A&M University at Galveston with a 2-0 record. In the Quarterfinal round, the 1 through 3 seeds won their respective finals. SUNY Maritime, Boston College, and Stanford moved onto the Semi-Finals. The University of Pennsylvania in fifth beat Dartmouth, who was in 4th, with a 2-1 record to move onto the next round. The first matches of the Semifinal round were completed before the end of the day. In the first race of the first-to-2 series, University of Pennsylvania beat SUNY Maritime, and Boston College beat Stanford. Yesterday, the third and final day of the regatta, saw similar conditions to the previous two days of racing, but with better winds. Racing began around 11 a.m. with a light westerly breeze on the course, which was set north of the Newport Beach pier. The final races of the Semi-Final round were completed with the University of Pennsylvania beating SUNY Maritime and Boston College beating Stanford in their races, which moved them into the Finals. SUNY Maritime and Stanford then had to compete for third place. In the first round of the 5th – 8th Semi-Series, College of Charleston and Jacksonville University moved onto the 5th place – 6th place knockout race after their respective races against Dartmouth and University of Wisconsin. Charleston won the single race, ending up 5th overall, and Jacksonville finished in 6th. Dartmouth beat Wisconsin to take 7th place and Wisconsin finished in 8th. Stanford won the first race in their semi-final, after being penalized during the pre-start and completing the penalty on their second upwind. SUNY Maritime won the second race, tying up the series 1-1. In the third race, SUNY Maritime was over early, allowing Stanford to carry an early lead up the racecourse and securing a podium position with a win. The Finals also carried excitement with University of Pennsylvania and Boston College each taking a win in the first races. In race 4, it looked like Boston College would take the win with an extended lead up the first beat, but an incorrect mark rounding allowed UPenn to take another win in the series. During the final race, Boston College and UPenn split off the line and battled their way up the course. 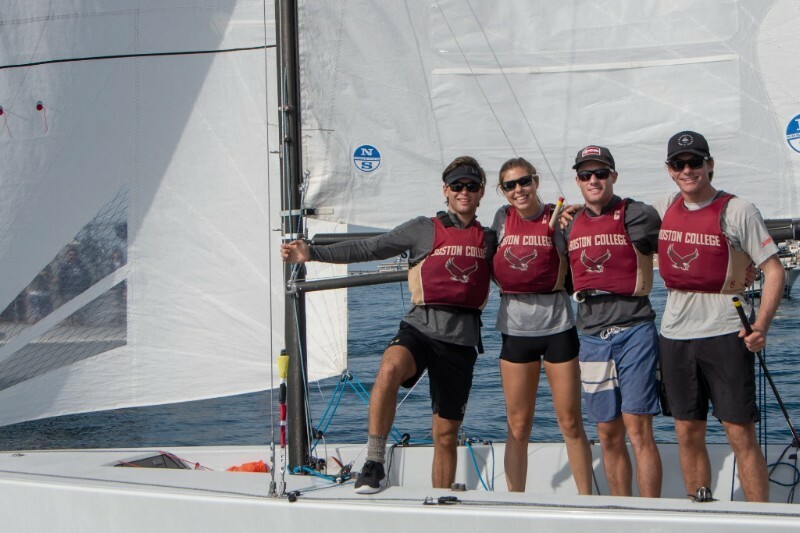 Boston College led from the top mark for the rest of the race, and crossed the finish line to claim their ICSA Match Race National Championship for the second year in a row.